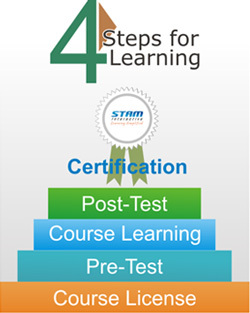 Welcome to STAM Online Training Courses, a world class repository of courses on security technology. The subject of Security is highly technical and is made up of many different and emerging technologies. Each of these technologies is complex and is undergoing continuous change. This makes it difficult for anyone in the industry to keep up with the latest trends. If you look around the industry there are limited options for people to gain this knowledge. STAM understands this and has designed and developed a wide range of Online Training Courses on Security Technology, to meet industry requirements. The STAM online courses are a proven resource - over 15,000 students from 60 countries have completed these courses. The courses are suitable for everyone in the security industry. They are available 24/7, making STAM the most cost effective solution for anyone who wants to improve knowledge or skills on the latest security technology - an individual or everyone in the company. Compliant with Electronic Security Association (ESA) for Continuing Education credits. Besides the information about the online courses, the web pages have many other tools and resources; please take the time to explore them.